Sovereigns and sovereignty have long been key aspects for histories of international law. Doctrinal definitions of sovereignty have been instrumentalized in political struggles throughout history. In the era of revolutions, instrumental uses of leading law textbooks like Vattel’s even led to constitutional overthrows. Therefore, changing ideas of sovereignty, the emergence and disappearance of particular sovereign states, and the sovereignty of international organisations inspired much debate among lawyers, and between lawyers and politicians in the last centuries. 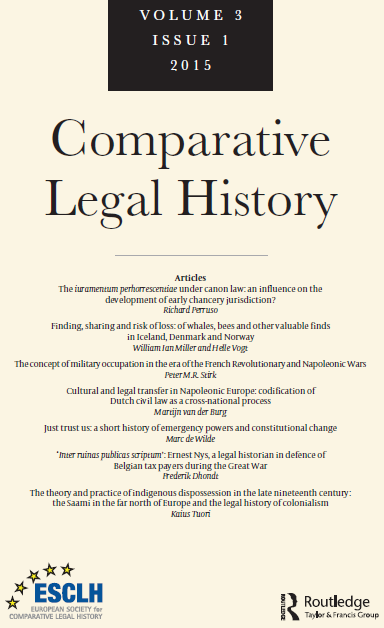 More recently, many of the major works in the contemporary revival of international legal history took sovereigns, their empires, their equality or inequality or even their property as starting points for new critical histories of the discipline and the role of international law in the expansion of the European state model or the rise of imperialism. · Potential paths for the field to explore now that the critical works have become the new mainstream literature. For example, what might a revisionist history of sovereignty look like? · The hybrid nature of legal argumentation in specific political and constitutional struggles and their transnational reverberations. · Papers exploring to what extent the centrality of sovereignty in the history of international law is warranted. · Examples of resistance to interpretations of sovereignty, or the concept itself. · Forgotten sovereigns and interpretations of sovereignty. Papers using underexploited primary sources or involving archival work will receive our special attention. We particularly welcome proposals from and about women, and encourage early career scholars or those without current university affiliations to apply. We consider submissions written in French and English. Abstracts of up to 500 words must be submitted no later than 30 April 2019 to esilighil@gmail.com on behalf of the Steering Committee of the Interest Group, which shall collectively supervise the blind peer-review process. The Interest Group is unable to provide funding for travel and accommodation. Please see the ESIL website for information about travel grants and carers’ grants offered to ESIL members (deadline: 5 June), and other relevant information about the conference. Selected speakers are strongly encouraged to become members of the Society and to register for the Annual Conference; please note, however, that the Society is unable to offer reduced conference registration fees to speakers at pre-conference events (please do not register as agora speakers). Selected speakers can indicate their interest in being considered for the ESIL Young Scholar Prize, if they meet the eligibility conditions as stated on the ESIL website. The ESIL Secretariat must be informed of all speakers who wish to be considered for the Prize by 15 May at the very latest.